Here's another felt food item from Kara's pantry. I'm trying to stick to the healthy foods...at least for the moment, so here's a carrot. Sorry, for the lack of pictures on this one. I got distracted with the little one. This is super easy though. Just cut out a large triangle the size you want your carrot to be, adding a half inch for seam allowance. 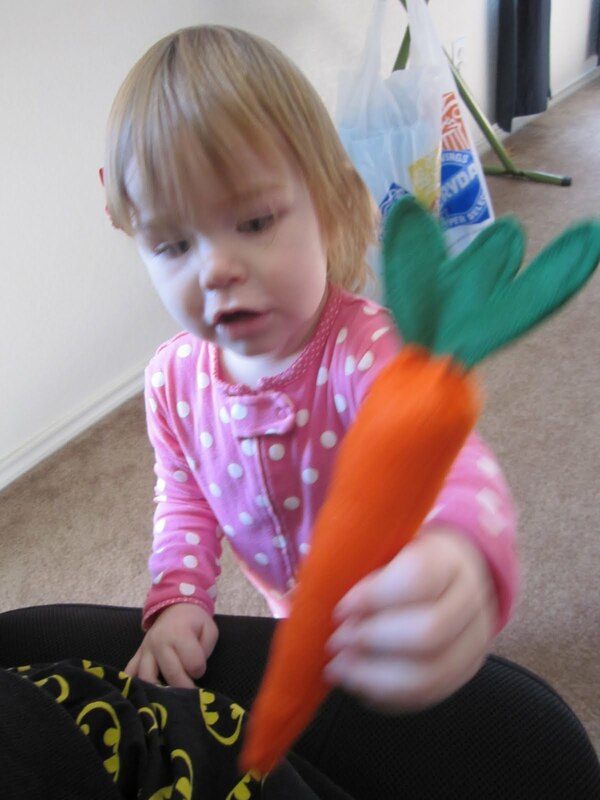 Sew lines in a slightly lighter or darker orange color than the carrot. So the lines should go horizontal up the carrot, starting from the tip and going up to the largest part. I think I ended up putting 4 or 5 lines. Then line up the edges of the carrot, sew together and then turn inside out. Next you cut out a little greenery for the top. Double it up and sew together. Stuff your carrot full of polyester filling. Then bust out your needle and thread. Thread in and out all the way around your carrot top, then pull in closed while sticking the greenery there. Then slowly but surely attach the greenery by going back and forth through the carrot top and greenery. Pull in tightly closed as you go, so you won't lose any of the filling from curious fingers. Then finish your thread off and your carrots all set to go. Yes, I rocked out this carrot while Kara and I were both still in our pajamas. Did I say I love being a stay-at-home mom yet today?! Because I do!! And yes, those are batman pajamas :) I know you're jealous.